ARE THEY POISONING OUR ATMOSPHERE? Ruanel: Hello, How are you? Interlocutor: I am really intrigued by the topic I scheduled today. Could we start directly with the questions? I mean if there is no urgent message, of course. Ruanel: Let’s go directly to the questions. Interlocutor: My first question is related to the “chemtrails” as your already know there is a lot of speculation about it, because whereas some people say that they are a normal waste of airplanes, others say that they are chemical products that the military are spreading in the atmosphere like bacteriological experiments or directly to weaken people with the purpose to control their minds and also a demographic control. 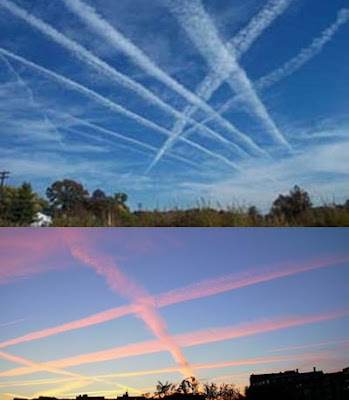 Those that denounce that something strange is happening in our skies they distinguish the chemtrails from the "contrails" which are the normal trails left by airplanes. The concrete question is: Are they poisoning us or is it only an urban legend? Ruanel: There is a quite dangerous and bacteriological issue of contamination in the atmosphere. Interlocutor: I cannot believe it! Do they do this on purpose? Ruanel: Yes, of course they are doing it on purpose. Interlocutor: Who are doing this? Maybe the people of Area 51? Ruanel: The Area 51 is involved somehow but the contamination doesn't come from there. Ruanel: Those who are contaminating the atmosphere are a dissident extraterrestrial race of Area 51. The extraterrestrials of this Area are not there permanently, but rather they go back and forth, that is to say, suddenly they are part of this place and later on they leave and others come. Interlocutor: I understand that the authorities of Area 51 are terrestrials and not extraterrestrials. Is this correct? Ruanel: Yes, it is correct. One of these dissident races is the one that is contaminating the atmosphere. Interlocutor: But what is their purpose? Interlocutor: How to contaminate? Contaminating without any purpose? Ruanel: The only purpose is to harm. Interlocutor: Are we speaking, concretely, of a vengeance? Ruanel: We are talking about that. Interlocutor: What I don't understand is that the people who are in charge of the topic, they speak of terrestrial and also military airplanes. I mean that they don't speak about UFOs. Ruanel: They are extraterrestrial microships that reach the stratosphere, they are not terrestrial but extraterrestrial. Interlocutor: Are those ships similar to our airplanes? Ruanel: Similar to airplanes of advanced design, with delta wings. Interlocutor: Now I understand the confusion of those that have seen those ships. Somehow Do they pretend they are military airplanes? Ruanel: Yes, because that is the idea they have harming in such way, so that people think that military airplanes are poisoning the atmosphere. Interlocutor: I have read on the web that the military personnel obviously deny that somebody is contaminating the atmosphere. But the question is if they know the truth. Ruanel: Of course that some of them know the truth, but most of them don’t know it. Besides, they are ships that travel at a speed of 12.000 and 15.000 km./h. Obviously no terrestrial airplane can achieve that speed. Interlocutor: I understand. Do these machines have the support of some mother ship? Interlocutor: Well. At the beginning you said that Area 51 was involved with the aliens that are polluting since they belonged to this Area and then they became independent. Interlocutor: Aren’t they any more at Area 51 at all? Ruanel: Correct, they became independent. Interlocutor: What is that polluting matter they expel? Ruanel: They have experimented with human organisms and extraterrestrial organisms of other races and they have been able to produce pathogen virus highly powerful. Interlocutor: You also said that their purpose was only to harm. Interlocutor: Sincerely I don't understand. Ruanel: What you don't understand? Interlocutor: That they simply bother for something like that. Ruanel: For them it is not any trouble because they have the technology and the speed of their ships. Interlocutor: But what kind of aliens are we talking about, maybe monsters? Ruanel: They are directly evil extraterrestrials. Interlocutor: I admit that I feel quite confused and I am not able to assimilate it. Where do these aliens come from? Ruanel: They come from a star which is at 6 light years from Betelgeuse. Ruanel: Novix 2. Novix 1 was a white dwarf that at this moment is a Neutron star. A star rotates with the other. They are, as I said, at a distant of 6 light years from each other. Interlocutor: And how far away are they from us? Ruanel: at 400 light years. Interlocutor: How is the morphology of these aliens? Ruanel: They are black, of a very similar size to terrestrials, but with the structure of the Grays, that is to say, they hardly have a nose, hardly ears, wide forehead, bald front. Ruanel: Around 1,60 m and 1,70 m . They have a very thin contexture. Interlocutor: How many members of this race are there on the Earth? Interlocutor: How many ships do they use to pollute the atmosphere? Interlocutor: Only four! nothing else? But practically there have been denounces of all the countries of the world! Ruanel: You are forgetting the tremendous speed of their ships. Interlocutor: You’re right, I forgot that “small” detail. Ruanel: They can cross the Atlantic Ocean in one hour or so with those ships. Interlocutor: I understand. But now I cannot stop wondering what is the reason that from Area 51 nobody is doing anything, because after all they are contaminating the planet in which they also live. Can’t they persuade them to desist? Ruanel: No, they cannot do anything because those aliens became independent and they no longer depend on Area 51. Interlocutor: And by the force? Ruanel: If they use the force they would provoke panic on the population and they would expose themselves. In these moments at Area 51 there are two races- let’s call them "friendly" -that are studying the way of combatting those ships without causing panic and without being exposed. Interlocutor: What do you mean when you say without exposing themselves? Ruanel: I mean that they not be captured by the radars, because if there were a battle in the sky, in spite of the antiquity of these machines compared to the ships that these aliens have, they would capture everything. Interlocutor: I understand. And these polluting aliens will enter into battle? I ask it because I have to suppose that they may be evil, but they are not silly, in the sense of fighting for something so futile. Ruanel: They won’t fight, but rather they will simply leave. They also have a single mother ship and they can’t do a lot with it. Interlocutor: So we cannot say that we are completely defenseless before these stupid aliens. The term came out from my heart, as one commonly says. Ruanel: It is what they really are, cretins. It happens also from the point of view of the evaluation of the officials of Area 51 that the damages are minimum. And they are also hoping in the end that they get tired of what they are doing, as it happens to children with their toys and eventually they leave. Interlocutor: It’s not easy to conceive that aliens, with that enormous technology be acting at such primary level. Are they really so childish? Ruanel: The same as terrestrials! Interlocutor: It is a very strong example, Master! Ruanel: Think a little over it and you will see that I am right. Isn’t it the same thing that Bush and Bin Laden are doing, just to mention two of the most conspicuous cretins? Interlocutor: Yes, it is true, but it’s hard to conceive extraterrestrials acting like children. Obviously is their reactive mind the one that impels them to do that? Ruanel: Correct, and they have a humongous ego. Interlocutor: These aliens make me remember those who are devoted to manufacture virus only for the wickedness itself. Ruanel: If you start looking for examples you will find many. Interlocutor: Yes, unfortunately yes. Does the American government know the truth? I mean to the president Bush concretely. Ruanel: The American president is not even informed of what will happen the day after tomorrow. How could he know something like that? Interlocutor: Do you want to tell me that plainly and simply he is null? Ruanel: The higher military authoritires know it, but only those that are in contact with Area 51 and therefore they know that extraterrestrials exist and they are here. Interlocutor: The military authorities that are not in contact with Area 51, then, Do they ignore everything? Interlocutor: Here I have a report of a magazine called “Akasico” that says that all this matter of contamination is false and that it is a normal waste of the airplanes. Ruanel: What do you want me to tell you, if you already know it? Interlocutor: Okay, Master, I already understood. Returning to the topic, what is concretely the thing they are disseminating in the atmosphere? Ruanel: They are pathogen virus extracted as I already said, from experiments carried out with terrestrials and also extraterrestrials. In their laboratories they have created new virus that don't exist in nature. Interlocutor: From the human point of view, what would be the damage that this contamination is causing? Ruanel: The biggest damages are caused in the flora. Interlocutor: But don't we eat vegetables? Ruanel: Yes, of course, but fortunately the physical damages in the human beings are minimum. Interlocutor: And when these affected people go to the hospitals, what do the doctors diagnose? Ruanel: The doctors speak of “unknown virus”. They are so blind! Interlocutor: How long are they contaminating the atmosphere? Ruanel: Sure! For five years the doctors are receiving infected creatures with those viruses and they diagnose bronchopneumonia erroneously and they attribute it to toxic waste that the tanneries toss to the rivers and other things like that. Interlocutor: How is possible that Area 51 during five years didn't find any solution? Ruanel: It’s not they didn't find any solution, but rather they are in the dilemma that any warlike confrontation is risky and they could be exposed and that the truth of Area 51 be known. They prioritize to stay hidden. Besides they are very selfish and they worry about their own issues without caring too much of what happens outside. Interlocutor: I understand. Is there some cure for the dysfunctions provoked by that virus? Ruanel: No, because it has not been studied. Interlocutor: Not even at Area 51? Ruanel: Not even at Area 51. I already said it and I repeat it: they are selfish and they only worry about their own personal interests. Interlocutor: Is this everything about this matter? Ruanel: Yes, because giving more details would be a waste of time. This entry was posted at Friday, October 09, 2009 and is filed under Secrets . You can follow any responses to this entry through the .